Ladies and Gents, FCA gives us the Dodge Durango SRT, which is NOT just a gargantuan grocery getter. This is a performance machine that might make trips to soccer practice and the grocery store a little more exhilarating and entertaining. With 475 hp, 0-60 in 4.4 seconds, 8700-lb towing capacity, sport, track, or valet mode (to take the monstrous V8 down to a lively, manageable V6) and a day at the Bob Bondurant School of High Performance Driving, this $62,995 vehicle is something to think about if you are tired of hum drum. Oh, and it can do the quarter-mile in 12.9 seconds, which isn’t too shabby, wouldn’t you say? When FCA announced the death knell of the 200 and the Dart, many people lamented. Some of those people said that FCA squandered the design potential in really great mid-size sedans (that no one was buying because no one is buying mid-size sedans anymore, really). But let’s face it. Marchionne’s gamble is paying off, for us, the consumer. 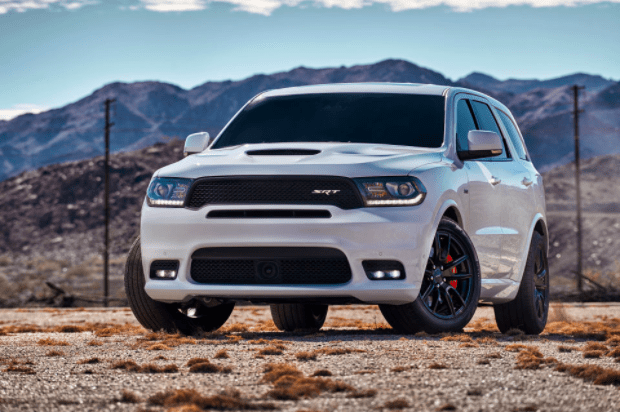 Since the announcement, we have had the Hellcat, the Demon, the Durango Brass Monkey edition—which Maxim also loved—and now the Durango SRT, not to mention some pretty sharp new Jeep models. It seems that instead of having a bunch of mediocre to adequate vehicles, we are getting some seriously high-performance vehicles that people want. Speaking of vehicles people want, it could just be me, but does it seem that the auto world is becoming split between those of us who love to drive and would relish a vehicle like the Durango SRT and the drivers who—well—don’t want to drive anymore? One end of the spectrum you have the advancement for autonomous drive vehicles and on the other you have FCA and many others producing vehicles that make driving what it should be. Just an interesting observation I had. It seems that FCA might know what it’s doing after all. I am interested to see what else FCA brings us by way of performance and design. Congress is going to allow about 100,000 self-driving vehicles on the road and bar states from setting their own safety limits. For clarification, the proposal has not been made law yet, it was not officially voted on, and the House won’t look at this bill until September. But the bill is designed to fast track autonomous vehicles onto public roads and prevent states from having separate safety laws. There isn’t much to discuss or debate, but it is interesting that Congress, not really known for being in tune with the will of the people, is trying to fast track self-drivers because it’s “safer” and who is pushing this mostly? Oh yeah, manufacturers who have millions invested, while some drivers are clamoring for more fun to drive vehicles.